More than 140 participants from around the world are up to that task, and their models, designs, photographs and other works are on display at the Chicago Cultural Center—both inside and on the building (look at the building’s façade along Michigan Avenue to see a colorful display). And it’s free. Community anchor sites and other partner organizations are also participating in the event. It’s a lot of architecture in a lot of places. Among the highlights of this year’s CAB at the Cultural Center: an exploration of the 1922 Chicago Tribune Tower competition in which participants reimagine the landmark building; an exhibition of innovative architectural photography; and scale-model dioramas that reconsider the interiors of iconic buildings. Exhibitions are also on display at anchor sites across the city, including the DuSable Museum of African American History, the National Museum of Mexican Art and the DePaul Art Museum. 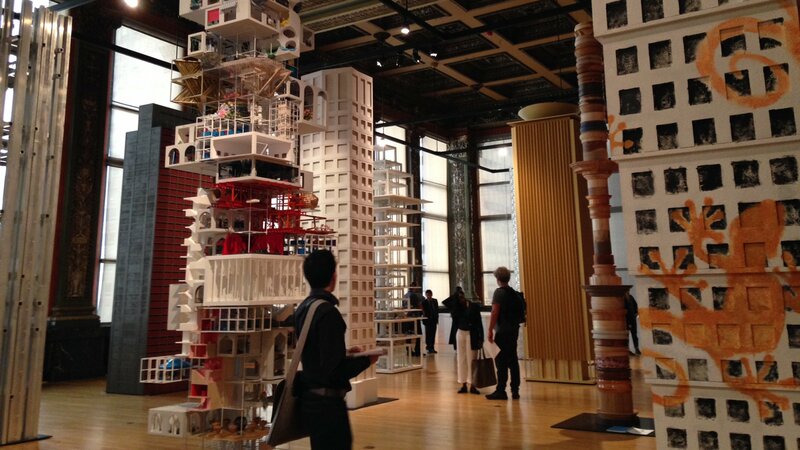 The Chicago Architectural Biennial opens Saturday and continues through Jan. 7. For more information, visit the event website. Sept. 13: Contemporary artwork is in the spotlight. We get a behind-the-scenes preview of Expo Chicago, the citywide art show at Navy Pier and other city destinations. Aug. 7: One of Frank Lloyd Wright’s finest public buildings is ready for the public again. We take a look inside the restoration of Unity Temple. April 14: The 92-story skyscraper is a regular feature of Chicago architecture tours. But a changing political landscape has led some tour guides to be more careful with their comments about the structure.